The Delphi Chronicle is a serial trilogy – a story that unfolds over three installments. This group of three books chronicles the saga of NY private eye Michael Derrigan, as he unwittingly comes into possession of a manuscript that will change the world order if its secrets are aired. Clandestine factions of the U.S. government will do anything to keep the story buried, and a trail of butchery follows Derrigan as he races for his life in a chase that takes him from New York, to Mexico, to Havana. An epic roller-coaster ride of a thriller, The Delphi Chronicle’s unflinching and often disturbing twists and turns question the nature of reality and of the integrity of our governments in a post-modern world of lies, deceit and betrayal. Questions & Answers with bestselling author Russell Blake. 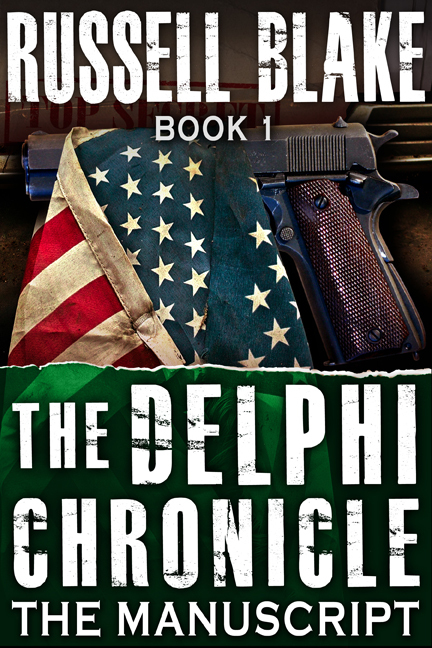 Question: The Delphi Chronicle posits a troubling & plausible conspiracy. Where did you get the idea? Russell Blake: The idea stemmed from the title. I was originally going to call the trilogy The Pegasus File, & I’d conceptualized a cool cover, so I decided to google it and confirm there weren’t any other books with that name. The original conspiracy was much tamer than what I wound up with after that search. I had the idea of a literary agent getting a manuscript detailing a shocking set of allegations, but I hadn’t defined what they were, exactly. From that search came this conspiracy, & I have to admit I considered toning it down a lot, because it scared even me. So readers? This is fiction, OK? And U.S. government? No need to send a wet team after me. We all understand it is fictional. As in, an invention, not real. That’s my official position. Readers can decide how plausible the invention is for themselves. Q: Why write it as a trilogy? RB: It would have been a very long single volume if I’d tried to squeeze it all into a single book. Given the success I saw with the Zero Sum trilogy, I wanted to do another one, and this was just naturally written in three volumes, although I think most will get the first one, and then buy the specially-priced bundle of Books 2 & 3 if they’re interested in following the story to its thrilling conclusion (wink wink). Q: How do your novels compare to the work of your peers? Q: Part of Delphi unfolds in Mexico. Any particular reason? RB: I live in Mexico. Have for almost a decade. Modern Mexico is very different than the way it’s portrayed by the U.S. media. Many parts are indistinguishable from medium sized cities in the U.S. Strip malls, high rises, melting-pot racial integration, etc. It’s not burros and cactus and sombreros. One of the things I find fascinating is how different it is than what my expectations were for when I moved here, and I try to impart that in this book. I don’t see many novels that are set in modern Mexico, and most I’ve read are caricatures of the truth. Mission bells, white-garbed peasants, mariachis, stereotypical characters. I try to imbue my fiction with reality, not some Hollywood portrayal of the country based on a snapshot from the 1950s. I think readers will find that distinction interesting, as do I.